Theresa May’s snap decision to call a General Election in June in the UK, got me thinking about Bermuda. With the OBA down to 17 guaranteed votes in a House of Assembly where 19 votes constitutes a Parliamentary majority; with six economic ‘fundamentals’ still not lining up to pull Bermuda out of its nine-year recession; with the next General Election less than twelve months away; who to vote for in Bermuda’s upcoming General Election is an avalanche issue. By mid-February next year , votes will have been cast. A national decision will have been made. So who should get your vote? I cannot give you a full and easy answer. There are too many factors rumbling around. However, my partial answer is that you should vote for the Party that displays the wisdom and political discipline to break completely from the recent past and forge a better way forward. The break? The Party seeking power after February 2018 [sooner if a General Election is called before 17th December 2017] makes one small amendment to the Government Loans Act, 1978. The suggested amendment is highlighted and is completely self-explaining. Under Bermuda’s existing thirty-nine year old law, any Minister for Finance can borrow any amount that he or she chooses. Bermuda’s Finance Minister is not required to get anyone’s specific permission or agreement beforehand. This lack of control of is wrong. In April 2017, Bermuda’s incredibly high gross National Debt [$2.484bn, 252% of actual Revenue, and 41% of GDP] and consequential dangerously high Nanci feeding cost of $509,860 a day proves how wrong that law is. 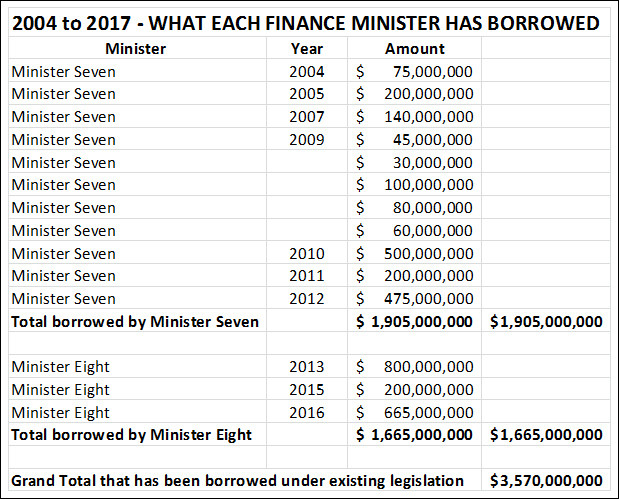 This Table shows how many times Finance Ministers Seven and Eight flew overseas, borrowed from foreign lenders, flew back, and only then TOLD us what additional fresh debt we Bermudians now owed to foreign lenders. Between June 10th 2004 and October 1st 2016, Finance Ministers Seven and Eight borrowed a grand total of $3.57 billion and dumped the responsibility for repaying that Debt on us 50,000 on-Island Bermudians and any non-Bermudians who are working here. Fourteen times in twelve years – on average, every 300 days – one or other of the two Ministers borrowed then dumped! Apart from gender and political affiliation, the only difference between the Ministers, is that Minister Eight at least told us beforehand that he would borrow. But simply telling us is insufficient. No household, no small business, no big business, no nation, can operate with an uncontrolled Chief Financial Officer – unless that entity intends to self-destruct. Those twenty-seven words would force every Finance Minister to rise in the House; explain why there is a need to borrow; what she/he seeks to borrow; what he intends to do with the borrowed money; and how and over what timeframe he/she proposes to pay back the borrowed funds. That requirement gives Parliament the right and ability to question and then support or not support. It also gives Bermuda’s debt-repaying electorate an opportunity to express their full feelings before getting dumped with more debt. In response to the Minister’s request to borrow, the electorate can surround the House of Assembly; march in the streets; camp on their MP’s doorstep; petition or call their MP; or take whatever other group or individual action deemed likely to succeed. Or, as now, do nothing and meekly accept another load of dumped Debt. The first party that acts to change that law by adding that twenty-seven word amendment before December 18th 2017 gets first pull on my vote. Thanks for an easy to read article on the financial borrowing. I believe you could have added a statement that there was less need to borrow prior to 2010 as we had a surplus of funds! That surplus was wiped out 2010-2011 leaving us in an untenable situation. It is critically important to understand context. I do agree, the change in law would greatly support more accountability of borrowing. Not all debt is created equally. Bob Richards clearly added a significant amount of debt in 4 years, but there are two qualifications. First, like a household whose credit card debt spirals out of control, there comes a tipping point where debt and interest payments just increases exponentially and where more debt is required just to cover previous debt incurred. Absent cutting Govt expenditure radically (eg mass civil services layoffs – simply not tenable), there was nothing Bob Richards could have done to avoid borrowing. Second, he front loaded a lot of Bermuda’s debt requirements by going to the market early and financing multiple years of debt which would have had to have been paid no matter what. He tried to restructure our debt profile so that we could at least save some in interest payments. Sure, but Richards is still going to borrow $200 million more this year. Not long from now, those “not tenable” mass civil service layoffs are going to be happen anyway because no one will lend $200 million/year to Bermuda anymore. When that happens, the layoffs will be a lot worse than if they had started in 2012. As to the amendment, I see the populist appeal of requiring pre-approval for new borrowing. But it is entirely impractical and I would argue fiscally irresponsible. First, Government incurs a liability, for example, through contractual obligations, legislated mandates, etc. Second, Government has to cover the liability, for example, through revenue or borrowing. Requiring legislative approval to borrow could put the Government in the odd position of incurring obligations, through things like legislative mandates, paying government workers and their pensions, and the spiraling increase in debt over which new Governments may not have any control, but possible defaulting on repaying of those obligations if it cannot get approval to borrow. And this is not entirely out of the realm of possibility now that Government is in a minority position, especially as self-serving politicians see this as an opportunity to confuse the electorate and paint the need to borrow in an unflattering light. In so doing, we are potentially affecting (to borrow a term) the full faith and credit of the Bermuda Government. This is very similar to the debt ceiling debate that occurred in the US some years ago. Imposing the debt ceiling and then defaulting was highly irresponsible of Republicans; liabilities arise and creditors expect repayment regardless of legislative mandates. The way to address the problem of excessive debt is at the front end, ie, ensuring greater fiscal discipline and controls in incurring liabilities, rather at the back end, through a possible legislative straight-jacket. The amendment also completely disregards the role that Parliament already plays in approving the estimates, budget legislation and supplementals from the Government. Once the House approves the overall picture of public finances (with the most recent Estimates very clearly showing continuing, albeit shrinking, deficits), it needs to get out of the way and let the Minister of Finance take the necessary decisions to adhere to that. The amendment may well be unconstitutional insofar as it impinges on the Minister’s constitutional responsibilities regarding the management of public finances. It’s also worth noting the Shadow Finance Minister’s 2012 promise to borrow billions more than the OBA did in practice and his 2017 promise to spend lavishly on pie in the sky projects. Yes, the 2025 plan. Borrow more and then raid the pensions for “guaranteed investments” to be made by the government. Totally agree. It seems absurd that something of such national importance does not get tabled in the House of our representatives for debate and explanation. I have read the qualified & unqualified Auditor Generals reports. I know which party I will most likely vote for! So Minister Seven wasn’t a ‘cog in the wheel’ then? That equals approx. $235,300 per working person in debt, considering approx. 17,000 people employed. The politician must stop buying votes. Cut the civil service. There are approximately 34,000 employed people in Bermuda. I think the PLP booby trapped the next government by blowing the money. They did this knowing that they would eventually lose power and would need some form of political leverage since they could produce no provable history of good governance. However nobody in their “social agenda” benefitted did they. Over to you Onion Juice. Simple point, except for the inheritance of a structural deficit would the OBA have borrowed? Conversely, the previous government didn’t inherit a fiscal deficit? It’s important to present facts! The borrowing has been approved in the House with every Budget. Both parties’ Budgets have buried the Island in debt. Bermuda can’t stop borrowing. Bermudians love to drink. The PLP borrowed during the good times . The large run up of debt occurred over the same 5 years equal to the OBA . The structure of debt is such that the OBA could not change things without hurting a lot of people . But why is Bermuda so loyal to the Civil Servants . Not one lost their job , while the private sector has had to carry them and their Fat Pay Checks. What’s up with that Larry ? Well, the deficit is coming down , from 331 million to 230 million . Today it stands at 135 million . Slow but progressive . Not to imply PLP . Bob is doing a great job . Some say he’s cold, but most fish are .It is hoped that as we supported Morgan’s Point -157 million , AC -78 million , Wedco-39 million , that we would do the same and find the 4-million to help complete the shelter for the homeless. The OBA must show the same desire that we do for things , for People .Larry , Am I asking too much ? At least the words, ‘ accountability and responsibility ‘ have meaning again. We only need 18 working politicians. Sorry Larry, I think it’s about time that you say more than just 27 words.